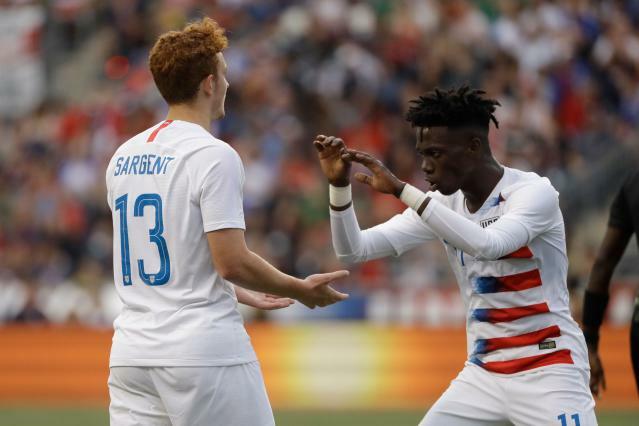 Josh Sargent and Tim Weah may have been surprise omissions from the United States men’s national team roster when it was announced earlier this month, but both young standouts will still gain some valuable international experience over the next week. The two 19-year-olds were among 23 players named to U.S under-23 squad by brand new coach Jason Kreis Tuesday for matches in against the Netherlands and Egypt. Both games will be played in San Pedro del Pinatar, Spain. Other familiar names included are defenders Cameron Carter-Vickers, Antonee Robinson and Matthew Olosunde and midfielders Djordje Mihailovic and Keaton Parks — all of whom have earned caps with the senior team within the last year. Goalkeeper Jonathan Klinsmann, son of former USMNT coach Jurgen, was also picked by Kreis, a longtime Major League Soccer coach who will attempt to qualify the American men for their first Olympics since the Beijing games back in 2008. Defenders: Julian Araujo, LA Galaxy; Cameron Carter-Vickers, Swansea City (Wales); Marco Farfan, Portland Timbers; Jack Maher, Indiana University; Matthew Olosunde, Manchester United (England); Donovan Pines, D.C. United; Lucas Pos, Lausanne (Switzerland); Antonee Robinson, Wigan (England), Miles Robinson, Atlanta United. Midfielders: Derrick Jones, Philadelphia Union; Cameron Lindley, Orlando City; Djordje Mihailovic, Chicago Fire; Keaton Parks, NYCFC; Eryk Williamson, Portland; Jackson Yueill, San Jose Earthquakes.